D No.5 Preliminary Sketch of Beaufort Harbor North Carolina. 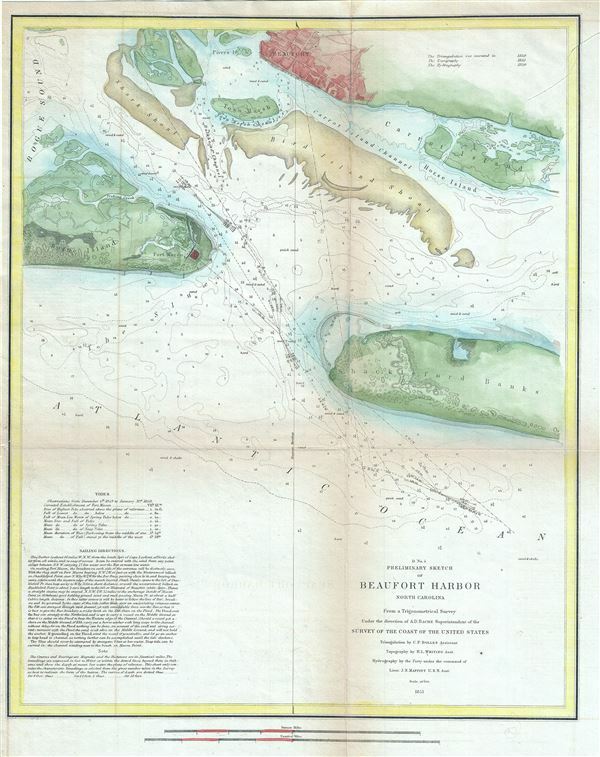 This is a beautiful example of the 1851 U. S. Coast Survey's nautical chart of Beaufort Harbor in North Carolina. It covers from the town of Beaufort south to the Shackleford Banks and includes parts of Carrot Island and Bogue Island. The map offers superb inland detail, noting streets and buildings in the town of Beaufort, Fort Macon on Bogue Island, rivers, etc. Countless depth soundings are noted throughout. The Shark Shoal and Bird Island Shoal are also included. The lower left quadrant features notes on tides and detailed sailing instructions. The triangulation for this chart was completed by C. P. Bolles with Topography by H. L. Whiting. The hydrography was completed by a party under the command of J. N. Maffitt. The entire chart was produced under the supervision of A. D. Bache, of the most prolific and influential Superintendents of the U.S. Coast Survey, and issued in the 1851 edition of the Superintendent's Report. Very good. Some wear and toning on original fold lines. Backed on archival tissue for stability.